The term ‘woodshifting’ gained some prominence after Blackburne had been interviewed by Brian Harley in the Observer (4 December 1921, page 9) and had called the games of that year’s world championship match ‘superior woodshifting’. Capablanca responded on page 7 of the 15 January 1922 edition (see pages 115-116 of our book on him). 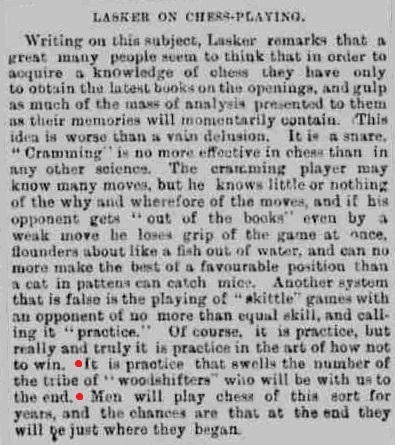 In a note to a game on page 6 of the January 1905 American< Chess Bulletin, C.S. Howell wrote, ‘Wood shifting as distinguished from chess’. We add that pages 144-145 of King, Queen and Knight by N. Knight and W. Guy (London, 1975) gave the above passage ‘translated by Professor Raoul Gaudin for the compilers’. Or is it the same passage? No reference to draughts is included, and the text reads, ‘Are you also losing your fame in wood shifting’. The text can also be found in the Traité-manuel des échecs by Henri Delaire (e.g. on pages 188-198 of the Paris, 1917 edition). 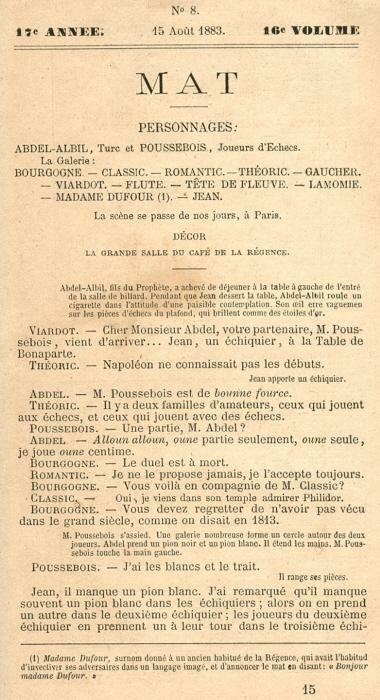 The obituary of Charles Joliet (1832-1910) on page 64 of the February 1910 issue of La Stratégie showed that he was a prolific literary figure. The story had been published on pages 108-109 of the April 1954 Chess Review. Source: Leeds Mercury, 25 January 1886, page 7. Latest update: 21 November 2016.